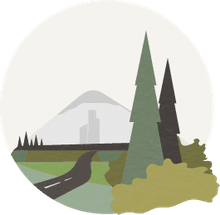 A History and Overview of "The Last Great Race"
Each year in March, men, women, and dogs from around the world converge on the state of Alaska to take part in what has become known as the "Last Great Race" on the planet. This race is, of course, the Iditarod and though it doesn't have a long official history as a sporting event, dog sledding does have a long history in Alaska. Today the race has become a popular event for many people throughout the world. The Iditarod Trail Sled Dog Race officially started in 1973, but the trail itself and the use of dog teams as a mode of transportation has a long and storied past. In the 1920s for example, newly arrived settlers looking for gold used dog teams in the winter to travel along the historic Iditarod Trail and into the gold fields. In 1925, the same Iditarod Trail was used to move medicine from Nenana to Nome after an outbreak of diphtheria threatened the lives of nearly everyone in the small, remote Alaskan town. The journey was nearly 700 miles (1,127 km) through incredibly harsh terrain but showed how reliable and strong dog teams were. Dogs were also used to deliver mail and carry other supplies to the many isolated areas of Alaska during this time and many years later. Throughout the years, however, technological advances led to the replacement of sled dog teams by airplanes in some cases and finally, snowmobiles. In an effort to recognize the long history and tradition of dog sledding in Alaska, Dorothy G. Page, chairman of the Wasilla-Knik Centennial helped set up a short race on the Iditarod Trail in 1967 with musher Joe Redington, Sr. to celebrate Alaska's Centennial Year. The success of that race led to another one in 1969 and the development of the longer Iditarod that is famous today. The original goal of the race was for it to end in Iditarod, an Alaskan ghost town, but after the United States Army reopened that area for its own use, it was decided that the race would go all the way to Nome, making the final race approximately 1,000 miles (1,610 km) long. Since 1983, the race has ceremonially started from downtown Anchorage on the first Saturday in March. Starting at 10 a.m. Alaska time, teams leave in two-minute intervals and ride for a short distance. The dogs are then taken home for the rest of the day to prepare for the actual race. After a night's rest, the teams then leave for their official start from Wasilla, about 40 miles (65 km) north of Anchorage the next day. Today, the route of the race follows two trails. In odd years the southern one is used and in even years they run on the northern one. Both, however, have the same starting point and diverge approximately 444 miles (715 km) from there. They join each other again about 441 miles (710 km) from Nome, giving them the same ending point as well. The development of two trails was done in order to reduce the impact that the race and its fans have on the towns along its length. The mushers (dog sled drivers) have 26 checkpoints on the northern route and 27 on the southern. These are areas where they can stop to rest both themselves and their dogs, eat, sometimes communicate with family, and get the health of their dogs checked, which is the main priority. The only mandatory rest time however usually consists of one 24-hour stop and two eight hour stops during the nine- to twelve-day race. When the race is over, the different teams split a pot that is now approximately $875,000. Whoever finishes first is awarded the most and each successive team to come in after that receives a little less. Those finishing after 31st place, however, get about $1,049 each. Originally, sled dogs were Alaskan Malamutes, but over the years, the dogs have been crossbred for speed and endurance in the harsh climate, the length of the races they participate in and the other work they are trained to do. These dogs are usually called Alaskan Huskies, not to be confused with Siberian Huskies, and are what most mushers prefer. Each dog team is made up of twelve to sixteen dogs and the smartest and fastest dogs are picked to be the lead dogs, running in the front of the pack. Those who are capable of moving the team around curves are the swing dogs and they run behind the lead dogs. 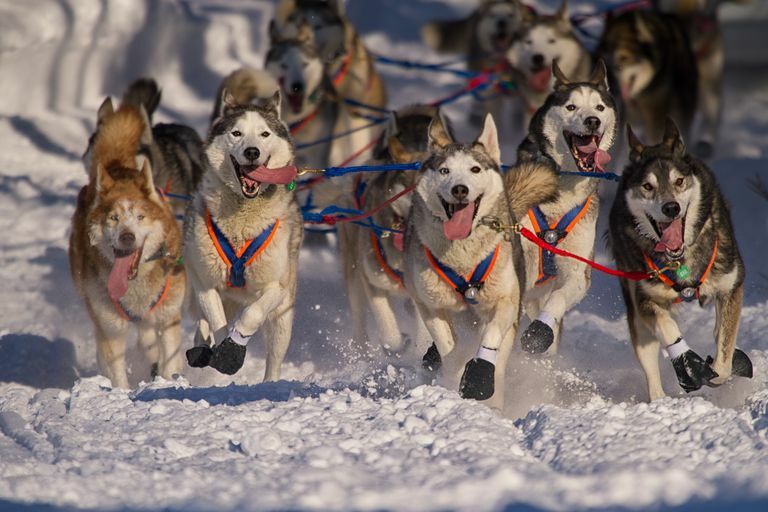 The largest and strongest dogs then run in the back, closest to the sled and are called the wheel dogs. Before embarking on the Iditarod trail, mushers train their dogs in late summer and fall using wheeled carts and all-terrain vehicles when there is no snow. The training is then the most intense between November and March. Once they are on the trail, mushers put the dogs on a strict diet and keep a veterinary diary to monitor their health. If needed, there are also veterinarians at the checkpoints and "dog-drop" sites where sick or injured dogs can be transported for medical care. Most of the teams also go through a large amount of gear to protect the dogs' health and they usually spend anywhere from $10,000-80,000 per year on gear such as booties, food, and veterinary care during training and the race itself. Despite these high costs along with the hazards of the race such as harsh weather and terrain, stress, and sometimes loneliness on the trail, mushers and their dogs still enjoy participating in the Iditarod and fans from around the world continue to tune in or actually visit portions of the trail in large numbers to partake in the action and drama that is all part of "The Last Great Race."